This is a super simple way to prepare chicken and as the original Dr. Oz recipe suggests, you can even roast your side vegetables simultaneously on the same baking dish. I made the Roasted Sweet Potatoes, and while Roasted Asparagus would pair wonderfully as well, I wanted something different to lighten up the meal. 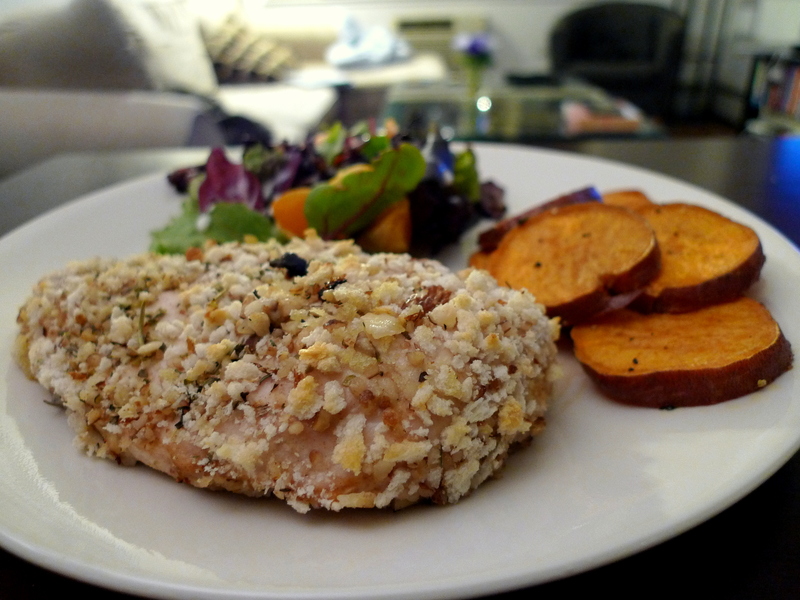 I came across a recipe for Almond-Crusted Chicken and Nectarine Salad with Buttermilk-Chive Dressing and was immediately infatuated with the idea of this salad. I had never used buttermilk before and ended up buying a whole carton to just use 1/4 C for the dressing. I now have a week to use up the remaining buttermilk before it goes bad… so basically that means you will be seeing a bunch of recipe posts that utilize buttermilk soon! This chicken can be served in a variety of delicious ways: 1) hot with some roasted veggies (Roasted Asparagus, Roasted Sweet Potatoes, Garlic Parsley Potatoes, Pureé of Garlic Potatoes) for a great savory meal, or 2) chilled or warmed over a light salad, such as a Nectarine Salad with Buttermilk-Chive Dressing. The possibilities are endless! Preheat the oven to 450°F. Using a food processor, finely chop the almonds and pecans. Transfer to a wide, shallow bowl and mix in the panko bread crumbs and dried basil. Season with salt and pepper. 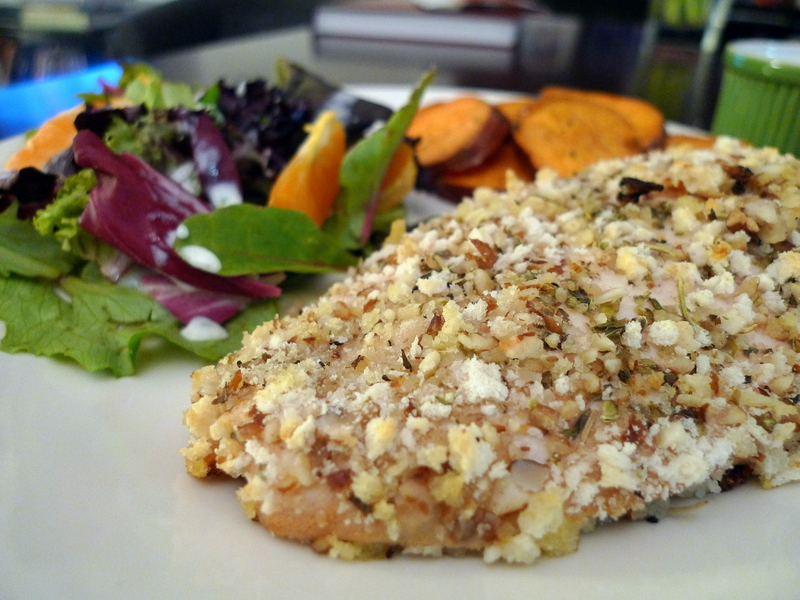 Rub each chicken breast with honey mustard, then dredge in the nut and panko mixture so it is completely coated. Place the coated chicken on a nonstick baking sheet and drizzle with 3 tablespoons olive oil. Bake until the juices run clear, 15 to 20 minutes. If you are just making a single serving, you can even roast your side vegetables on the baking sheet next to the chicken as the cook times are very similar. Toss some asparagus and / or sweet potato circles with extra virgin olive oil, salt and pepper and lay on the same baking sheet. Try serving this chicken warm with some roasted veggies (Roasted Asparagus, Roasted Sweet Potatoes, Garlic Parsley Potatoes, Pureé of Garlic Potatoes) or chilled over a light salad, such as a Nectarine Salad with Buttermilk-Chive Dressing. Or do both like I did!